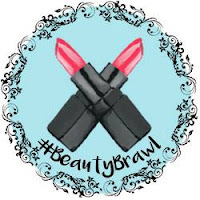 It's day 3 of 10 of #BeautyBrawl! I can honestly say I have been loving doing this! 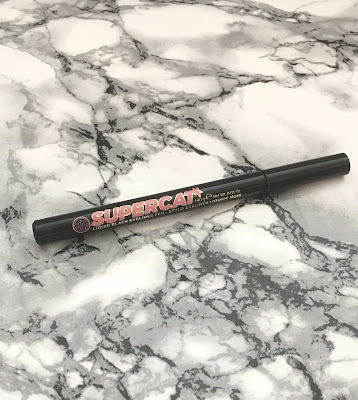 Today my review will be on the Soap & Glory Supercat eyeliner pen in carbon black. Product: So I rated the Soap & Glory Supercat eyeliner at 95/100! So to be honest I couldn't fault this. I love the application, the tip of the pen is a fine point so you can either create thin lines or thicker lines. It's so easy to control, which makes it all the more easier to create your desired effect. I think my favourite thing about the eyeliner is the colour. The black is so intense! The only one thing I will say about this is, give it good time to dry. If it doesn't have enough drying time it is likely to smudge. Packaging: So I gave it 90/100 for packaging. It comes in a box (which I forgot to take a picture of) and in true Soap & Glory style, it is beautiful. I love the bold writing on the eyeliner itself. The reason I only gave it 90. I don't really need a box for it. So it is just excess packaging I will end up throwing away. as much as I would love to, it will just be too bulky in the draw where I keep eyeliners and mascaras. It is a nice touch though. Price: I think this eyeliner is great for £6. I think it's a pretty standard price for a high street eyeliner and I would most definitely buy this again. I'm rally looking forward to trying this out some more. You can find this on the Soap & Glory website or in your local Boots store. Want to read another review? Head to Beauty that walks. What eyeliner would you recommend? I have read great reviews about this product. I absolutely love this eye liner and totally swear by it; I haven't used another eyeliner since I picked this up in boots last year! Excellent choice! I love the way you talk about these products, keep on doing you! I love Soap and Glory products. I have this in my collection too but I don't use it. I think the product is great, just my hands are shaky and I can't do eyeliner haha. Oops. Great post. Omg this eyeliner looks brilliant! I love the pens they always work for me. Ooh I've heard good things about this before so it's good to know that you agree! I love reading your make up reviews! They inform me so much on a subject I know so little about! If I ever need an eyeliner, this will be the one I get. I've heard so much about this but I dont really wear eyeliner so ive never really tried it!